You’d be pretty unhappy right? I mean – it would be hard to breathe, move or do ANYTHING well. 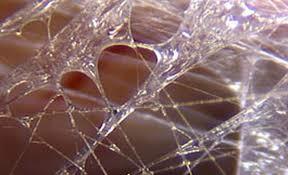 If you’re walking around right now feeling achy, heavy, like a lead weight, OR if you’re in pain or recovering from an injury, then chances are your fascia – the connective tissue webbing that wraps everything in our bodies – is dehydrated, stuck to itself in knots and too small for you to move and live efficiently; not unlike how YOU would feel if your clothes suddenly shrunk. 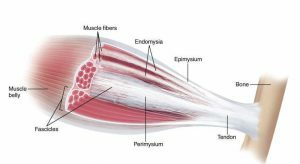 Fascia wraps every nerve ending in the body, every muscle fibril, muscle fiber and muscle bundle and all that fascia turns into your tendons and ligaments; it wraps our bones and our organs…it’s EVERYWHERE. Now, imagine an electrical cable: the WIRE inside is kind of like our NERVES, and the coating is our fascia. Fascia is crucial for proper nerve communication, and because of its close relationship to the nervous system – fascia takes on the PHYSICAL SHAPE of our EMOTIONS, SENSATIONS and SUBCONSCIOUS feelings and patterns. This means we can re-wire the brain by changing the fascia, which requires recruiting the nervous system and clearing out of our past traumas, memories, tension and anything that got stuck in our bodies on even an emotional level but certainly physical. 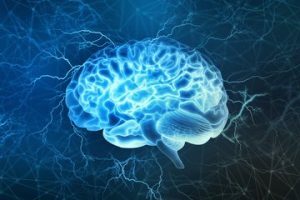 To learn more about how to rewire your subconscious brain for injury recovery and fast pain relief, click here. When we’re kids, we’re SHAPING our soft tissue with our physical, mental and emotional habits. Those myelin sheaths are getting laid down and our fascial system is getting molded by the way we sit, stand, run and what we think and feel on a daily basis. As we age – everything from overuse, underuse, trauma, stress, anxiety etc can creates a BUILD UP of tension within the fascial system that accumulates and eventually – this tension creates DYSFUNCTION. Want to learn more about the differences between fascial restriction and inflexibility, and how to use fascial release to gain mobility, lose the pain and when to use stretching to gain flexibility? Click here to read my blog post and watch my video series about this. Healthy fascia means we can do what we love for life. I’m the girl who couldn’t run for 8 years or hike for 6 – yet here I am now climbing mountains, trail running and doing whatever I want without pain or fear of pain. This is because I optimized my facia! Read more about my story. When fascia is supple, fluid and elastic it acts like a giant spring, or SHOCK ABSORBER for our entire body. We SHOULD be able to jump, run, and do whatever we want and feel light and buoyant as we do. If your body hurts when running downhill or during “pounding” activities like jumping, click here to learn why and what you can do about it. Healthy fascia won’t hurt AT ALL when compression is applied. For example, I could put my FULL body weight on your IT BAND and it would not hurt. I pinky swear. Unhealthy fascia HURTS when compression is applied, to varying degrees. If you get on a foam roller or someone steps on you, like me, and it hurts? That means the fascia is unhealthy. What does fascia NEED to get or stay healthy? SPACE. And nutrient rich blood. Space allows blood to flow. Blood nourishes every cell in our body, so our fascia, muscles, tendons, ligaments, joints, organs etc stay healthy. Fascia needs to be hydrated to allow our muscle fibers to GLIDE like they need to when we ask our bodies to move. Most of us have unhealthy fascia to varying degrees as adults, because we haven’t learned how to take care of it properly starting when we’re YOUNG. Ahhhh, hindsight huh? Want to re-wire your brain via the body? The COOL thing about the human body is that we can re-wire our brains via the fascial and nervous systems! We can bypass the conscious brain this way, which tends to play the same stories on repeat (which is why we don’t get different results even though we try different methods). Human beings are truly incredible. We can heal from the most horrific trauma. We can heal from horrific injuries. The power of the human spirit is one of the most awe-inspiring things to witness on this planet, don’t you think? HOW exactly do we re-wire our brains FAST? Most us looking to create change find methods that take a LOT of time, or consistent daily practices that are easy to forget and hard to commit to. I want to change this paradigm, because Kinetix can re-wire the brain FAST. It’s not rocket science, and it doesn’t take repeating mantras daily while looking in the mirror 😛 (nothin wrong with that, I’d just rather get it done fast and get it on with the rest of my life). Kinetix is the method I developed over the last ten years that combines fascial release with concepts of neuroplasticity and re-wiring the brain. 1) the intensity is ramped up so much (we’re sometimes stepping on people with full body weight!) that this alone can instantly interrupt old neural pathways. 2) But then you (the client) have to take action while feeling all those sensations and bypassing your reactivity instincts. What you’ve done in your life up until now was habitual – and you’re about to do something radically different. These two things(making different decisions + taking action on those decisions all while scrambling your brain with sensation) makes all the difference, and is what has the power to rapidly re-wire our brains. Want to learn Kinetix? Click here for the latest training events. What I most want to share with you is the power that effective fascial release has for eliminating pain at its source, releasing tension and trauma from the body and bringing us into INTEGRITY of mind, body and spirit, which is when we feel our best. Because fascia is EVERYWHERE and attaches our soft tissue system to our bones, it has a profound effect on our joints, nerves and alignment. When we build up fascial adhesions or restriction, these knots and areas of density can stop blood from flowing, irritate a joint that’s no longer getting fresh blood to renew the bursa, pull on bones or joints, compress nerves and cause all kinds of pain and alignment issues. Effective fascial release means FAST pain relief. I wrote a blog post and made a video that’s been quite controversial about this! To learn a little more about why fascia is resistant to change and “the ONE rule of effective fascial release” – click here. Most pain in the body can be significantly relieved and often completely eliminated in as little as a few minutes with the right methods, and even decades of pain can be reversed in a matter of several hours or weeks by looking to the fascial and nervous systems to create change from the inside out. I know that’s probably hard to believe, but I’ve seen this first hand in my practice and I’ve worked with thousands of people since 2008. This is why I’m SO passionate about bringing this information to all of YOU. So now that you know a little bit about what fascia is and the role it plays in the root cause of pain, I want to see you USE THIS INFORMATION to feel better because everything I just shared is kinda pointless if you’re not going to immediately put it to use, right? Click here or click the pic below to get FREE access to a video demo of my Kinetix technique for the quads and quad hip flexors. I’ll walk you and a partner through how to do this technique! If I had to choose only ONE technique to give everyone in the world that had a chance of making them feel their best, this would be it. What was your favorite tip from this video and post? Share in the comments here or on YouTube, and definitely let me know if you try my favorite Kinetix technique – what happened after you did it? Share below in the comments! I love what you’re teaching and the concepts of fascia and how to heal our bodies! Do you know anyone in Utah that does facia massage or what you do? I’ve been told I have fibromyalgia and was diagnosed over 20 years ago. I’ve been searching for pain relief but haven’t found it .